Nana Ming is my mom’s sister who at 83 is still passionate about baking. On our recent reunion, her daughter Gigi showed us pictures of elegant cakes she created for her grandchildren’s weddings and other special occasions. In her sheepish way, she cupped her face with her hands and said, “sometimes I don’t believe that I made them. That of course is an understatement. Nana Ming has always been a good baker. I still could picture a cake she created that resembled the tiles of mahjong. It was so beautiful I could still vividly visualize it, even if this was many years ago. As a kid, I always looked forward to spending summers and holidays at their house as it was filled with a sweet scent coming from freshly baked goodies. Home made Food for the Gods (dates and nuts bars) covered in bright red and green cellophanes, buttery ensaymada (Filipino brioche) adorn her kitchen like fixtures (though it would disappear fast haha). This is Nana Ming’s endearing way to make you feel a sense of comfort in her home. The scent, the taste and the feel of a freshly baked bread evoked a sense of warmth and love. When she moved to Canada, we missed her baking a lot. But her staples such as pan de sal ((which I shared here) and custard cake left an indelible mark in our minds… fortunately we were able to squeeze in some lessons when we had a chance to spend a few days together in Orlando. If you have any questions or if you want to keep in touch? Let’s be friends on Facebook and Twitter! In a heavy sauce pan, combine sugar and water. Do not stir. On medium heat, caramelize sugar until it turns golden brown. Immediately pour it over a 9 inch baking pan. Set aside. For the custard: Mix all ingredient together. Stir lightly using a whisk. Strain and pour it over to the caramelized pan. Set aside. Sift together all the dry ingredients. Beat the eggs and gradually add the dry ingredients and the flavored water. Set aside. For the meringue: Using a stand mixer , beat the eggs whites until fluffy and add cream of tartar and continue to beat until soft peaks begin to form. Gradually add sugar and continue beating until it becomes stiff. Fold the cake mixture into meringue mixture, until it is well blended. Make sure to eliminate any bubbles in the process. Slowly pour into the pan. Bake in a baine marie for about an hour or until firm. Let it cool. Run a knife around the pan and turn it upside down. 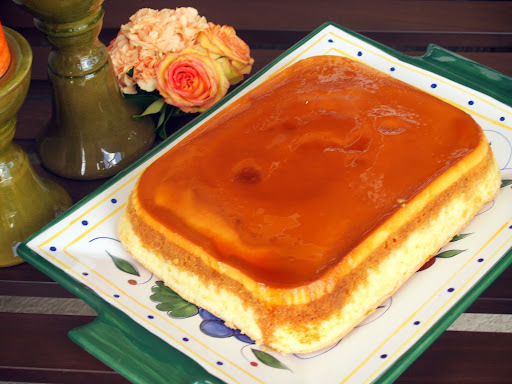 You will be delighted to see a golden, silky flan cake... enjoy! 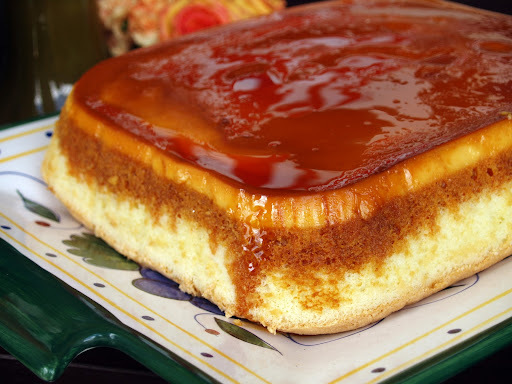 Flan… one of my favorites! I’m sorry for the late reply but to answer your question: No you don’t have to let the flan set. Pour the flan mixture then, pour the batter over it, slowly. Then make sure to bake it with baine marie (submerge your baking pan in a pan of water) This process helps the flan settle. Thank you for your question. If you have any more questions, come visit me at http://www.skiptomalou.net so I could answer your questions swiftly. or better yet come join me in my FB page https://www.facebook.com/pages/Skip-to-Malou/171154069592641 so you could ask your questions over there. my flan did not settle ms malou..what to do? ?i used 1 large can condense milk and 1 large can evap? ?tama po bah?? mali ka! gago ka kase! This is clearly a reminiscent of the cake I used to baked in the early 1980’s. A friend who went back to the Philippines taught me how to bake this delightful cake. I thought it was awesome as it was my first time to see one. I was literally and completely astonished. 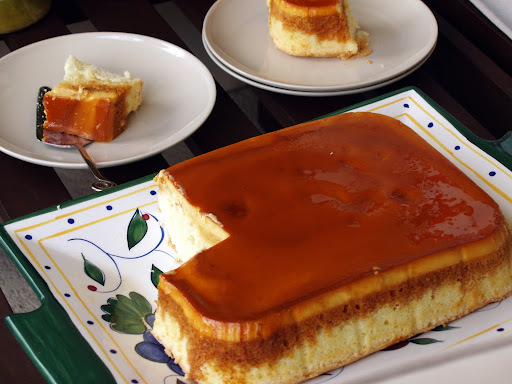 However, when making the creme caramel (the word custard is totally different), I tend to used more eggs, otherwise, your recipe/ratio of using 3 eggs to 1 tin of condensed milk and evaporated milk would be excessive, thus, the creme caramel will not settle; you will find it runny, as Karen Ibay found out. The ratio should be 6 eggs to 1/2 tins of condensed milk, evaporated milk and double cream. It is important “NOT TO WHISKED” the caramel mixture, otherwise, bubbles will formed. Just gently mix all the ingredients until they are all well blended; pass the mixture thru a fine sieve. 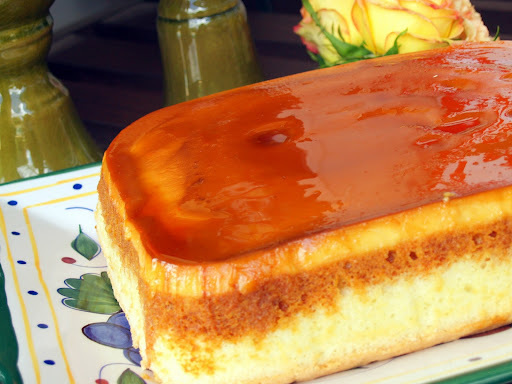 You want your creme caramel (Leche Flan) to be smooth with no grainy bits. I hope this info helps in some way. I ain’t saying your information is not solid., but suppose you added a post title that grabbed folk’s attention? little vanilla. You should look at Yahoo’s front page and see how they write news titles to get people interested. You might add a related video or a related picture or two to grab readers excited about what you’ve got to say. Normally I don’t read post on blogs, but I would like to say that this write-up very compelled me to try and do it! Your writing style has been surprised me. Thank you, very great post. I will immediately grab your rss as I can not find your e-mail subscription link or e-newsletter service. you’ve any? Kindly allow me recognize so that I may subscribe.